Sour cherries make the best pies. The vivid color, the tartness, but blink and you’ll miss their season. I hesitate to call it a season, because for the Bay Area it’s really one guy at the farmers market who may or may not have them one day a year. I haven’t seen them this year, but was lucky enough to be at the Ferry Building farmers market last year when they made an appearance. Within minutes word was out and people dressed in chef togs were jogging over from neighborhood restaurants to grab as many as they could. If you live in an area where sour cherries are bountiful–lucky you. If not, look for them in the frozen section of the supermarket. 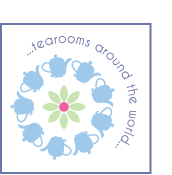 If you still can’t find them, see if any markets in your area specialize in Russian or eastern European foods. If you do use fresh cherries, pitting them can be a bit tricky. They’re smaller and softer than the larger sweeter varieties and don’t really work with the average cherry pitter. I use a toothpick to go into the stem opening and lift the pit out through the top. It can be a bit tedious. Do it while you’re watching that show. You know the one. Since hand pies became all the rage a few years ago, pie molds are everywhere. I own one, but rarely use it. Though adorable and capable of making it a bit easier to fashion smaller pastries, they somehow require an enormous amount of dough. Perhaps I’ve been doing something wrong, but… when I take the mold out of the equation I get more pies with less. That said, without the mold you encounter other problems, like how to make the little buggers without getting filling all over the place. With firm fillings like Nutella or lemon curd you can just roll out two sheets of pastry, plop little mounds across the one sheet, cover it with the other, cut, and you’re done. That doesn’t work so well with runny fillings like cherry. So after staring at all of my kitchen equipment for a long, long time, I think I found a way that works really well by freezing the filling in muffin tins to help it keep its shape. Because the filling contains so much sugar, it doesn’t freeze rock hard which makes it easy to unmold, and it was just solid enough to stay in place while I worked the dough around it. The finished product looked, well, darn cute. These pies freeze really well, so even if you don’t need 15 pies today, consider having them for later. An impromptu dinner gathering, a friend who needs cheering up… with these you’re just half an hour away from a little something special. 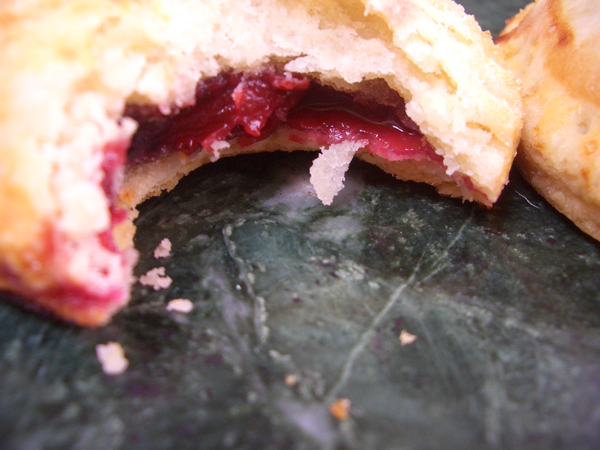 I used a homemade cherry filling, but you could use canned filling. Jam would do. And you can still use this method with firm fillings like Nutella to achieve the same shape. Mix the sugar and cornstarch together. 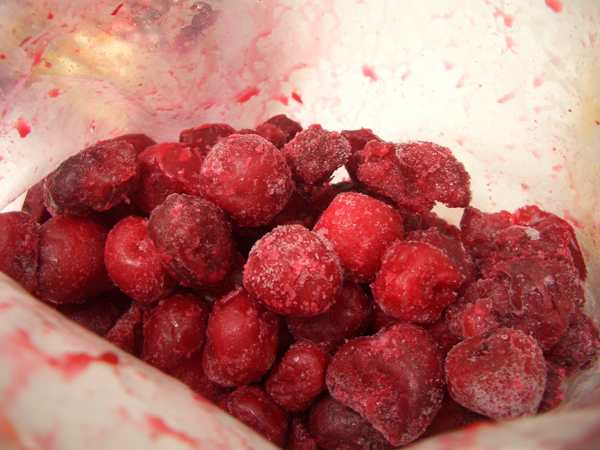 Put the cherries in a saucepan, add the sugar and cornstarch, toss everything together and let sit for 30 minutes. 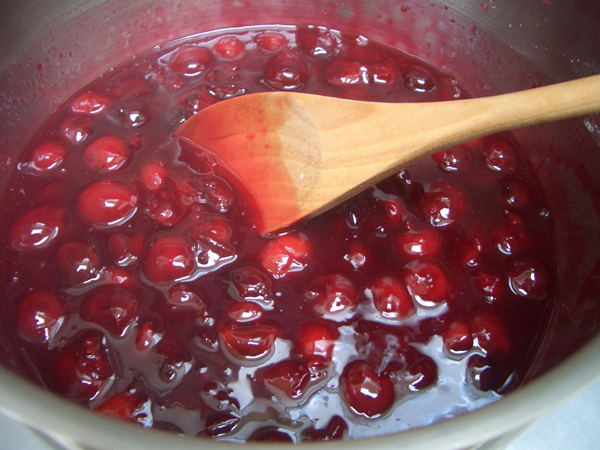 Simmer the cherries over medium heat until the sugar has dissolved and the mixture has thickened. This might take about 20 minutes. Let the cherry filling cool completely. 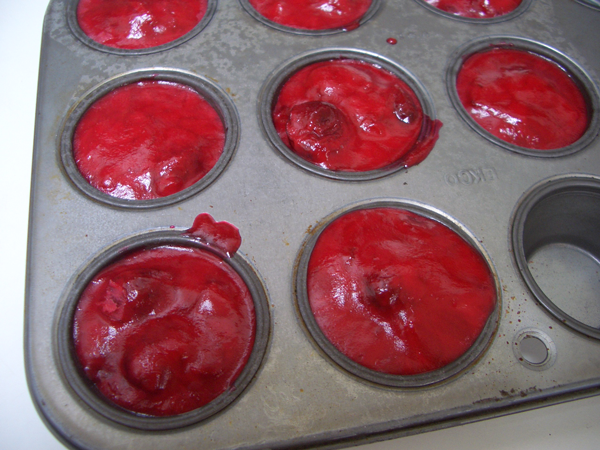 Spoon the cooled mixture into the cups of a mini muffin tin. Freeze for at least several hours. You can use a regular muffin tin, just don’t fill the cups all the way. You’re going to be using a 3-inch biscuit cutter so you want the width of the filling to fall within that diameter with a little room around the edges. This is the dough I use for most pies, sweet or savory, I’ve just doubled the two-crust pie recipe. Whisk the flour and salt together, or pulse a few times in a food processor. Work the butter into the flour with a fork or pastry cutter or pulse in a food processor until the butter pieces are the size of small peas. Add the ice water by the tablespoon until the mixture holds together when pinched. Gather it together in a ball, wrap in plastic wrap and refrigerate for at least one hour. You can do this a day or two in advance just make sure the dough is well wrapped so it doesn’t dry out. Make room in your refrigerator for the baking sheet and freezer (if you’re freezing the pies) so you don’t have to fuss with that when you’re up to your elbows in flour and dough. You’re going to be rolling out the dough on baking paper so you don’t need a large pastry marble or cutting board, just a counter or tabletop with enough space to make 11 x 17 inch rectangles. If you don’t have that kind of space, do several smaller batches. Lightly beat the egg with the water and set aside. Remove the pie filling from the cups, put on a plate and back in the freezer. Remove the dough from the fridge. Cut it in two. Cover one half with plastic wrap and put it back in the fridge. Dust one piece of baking paper with flour. Roll the dough on the paper from the center outward until it’s about 1/8-inch thick. 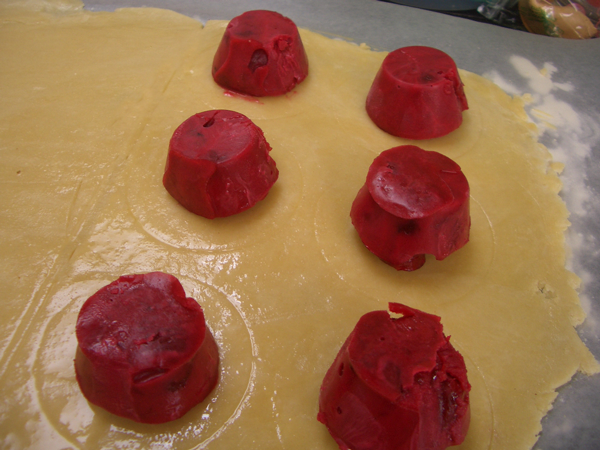 Lift the rolled dough onto the baking sheet and put in the fridge while you roll out the other half of the dough. 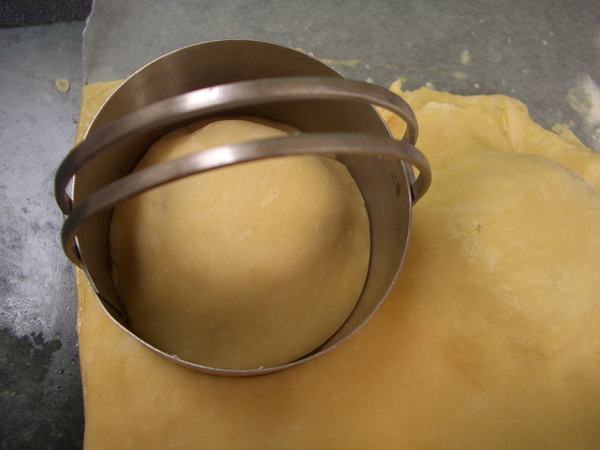 Brush the dough rectangle with the egg wash.
Lightly mark the dough with the biscuit cutter. Try to leave a little space between the circles. 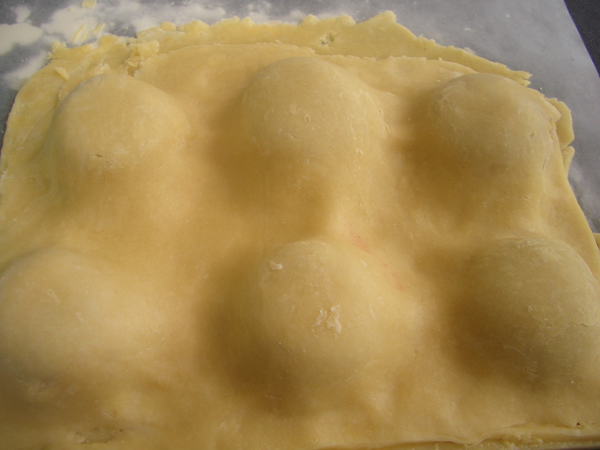 Remove the filling from the freezer and place one in each circle wide side down. Remove the other sheet of pastry from the fridge and–working quickly–flip it over so the paper is on top and carefully drape it over the mounds of filling doing your best to match up the edges. It won’t be perfect. Life goes on. Gently peel the paper off the top pastry. Using your fingers, gently ease the dough down between the mounds of filling. Gravity will do some of the work, but you want the two layers to touch all around. Don’t rush it or you’ll break the dough. If you break the dough, pinch it back together. One by one, center the biscuit cutter over each mound and cut through. Peel the excess dough away. Using the tines of a fork, press the dough down around the edges of each pie. Coat each pie with the egg wash, a sprinkle of sugar (if you like), and pierce the tops with a toothpick. At this point the pies can be frozen. 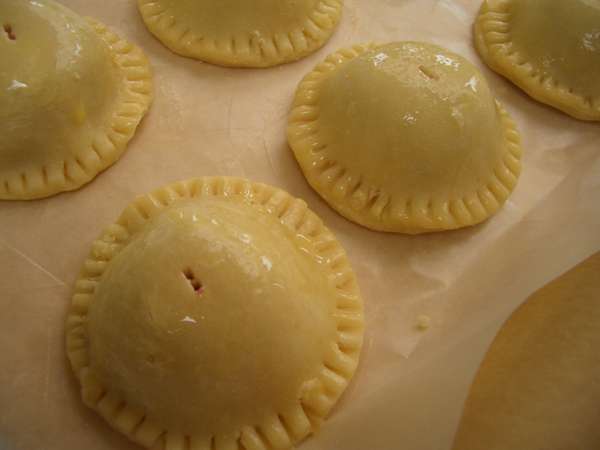 If freezing, place the pies on a baking paper lined baking sheet and freeze until firm. 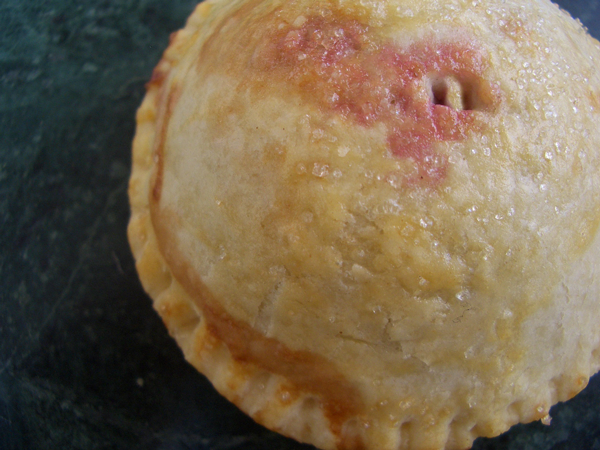 Put the frozen pies in an airtight container or plastic bag and freeze up to several months. If baking right away, preheat the oven to 350F / 175C degrees and bake for approximately 25 minutes until puffy and golden. Watch them carefully to make sure they don’t burn. You might get a little filling oozing out the sides, but it won’t go far and visually it gives the pies a little extra character.